Catholic Health Care Services (CHCS) and the Office for Community Development (OCD) are developing a new facility on Emerald Street in the neighborhood consisting of 40 affordable, one-bedroom apartment units for independent seniors. After expected completion of the facility in spring 2016, future residents meeting the required age and income level will have access to community rooms, laundry facilities and an outdoor garden space. CHCS will also provide supportive services to residents. The St. Francis Villa development received a $10 million tax credit last year from the Commonwealth of Pennsylvania to create affordable senior housing in East Kensington. The project is part of OCD’s 10-year plan for community development in the area surrounding Visitation B.V.M. Parish in Kensington. The 2009 Visitation Gateway Neighborhood Strategic Plan identified affordable senior housing as a need in the neighborhood. CHCS and OCD are working closely with two long-established community anchors in Kensington, St. Francis Inn and Visitation Parish, to generate and maintain community support for the senior housing development in the neighborhood. St. Francis Villa is the latest of other efforts by the archdiocese to create new affordable housing options for seniors. 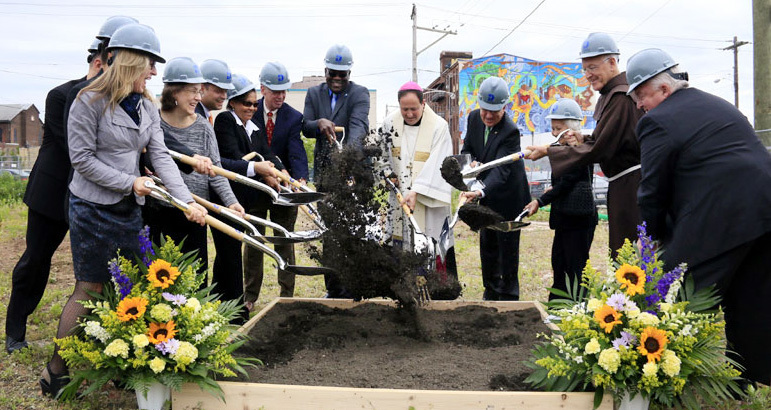 Last month archdiocesan officials announced a $12 million state tax credit will help develop more senior housing at St. John Neumann Place in South Philadelphia. The 75 new, one-bedroom apartments will be the second phase of a project completed in 2008 that reused the former St. John Neumann High School, offering affordable housing to independent seniors in their neighborhood. Last December another senior housing project that aims to reuse an existing building is a 63-unit project to renovate the former Nativity B.V.M. School in the Port Richmond neighborhood, not far from Kensington.